A striking literary debut of love and mortality perfect for fans of quirky, heart-wrenching fiction like Nathan Filer, David Nicholls and Rachel Joyce. Ivo has all kinds of everyday joy in his life - he's young, he's in love, he has friends who promise to stand by him if life ever goes wrong.Then one day, life does go wrong. He makes a mistake, and it's big and unforgiveable. Now time is running out and his life is falling apart. But he's going to put it together again. His own way. 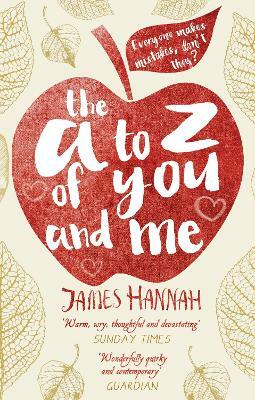 James Hannah has an MA in Samuel Beckett studies and The A to Z of You and Me is his debut novel. He also sings and plays guitar and drums in various bands with friends. He lives in Shropshire with his family. Find out more at www.Jameshannah.com and @JamesHannah .